This episode of the podcast is going to be a fun one! Today, I have my very own business coach here with me. Leslie Samuel and I met at the San Diego Digi-Colab conference in 2014, when I had just began Simple Pin Media. When I had a slew of people want to hire me at once, I had to make a decision – keep this as a small side hustle, or grow it into something bigger. My friend who had taken me to the conference had just hired Leslie as her business coach, and when she told me that he only had one spot left for coaching, I basically begged him to take me on. Happily, he agreed, and in that time he has helped me to grow this business beyond what I had ever dreamed. Leslie is a man of many talents. He has a blog, Become a Blogger,where he teaches people how to start a blog; he has a podcast; he runs a membership site where he works personally with people trying to build blogs; he does one-on-one coaching. And in his spare time, he is the head of training for Social Media Examiner. I want to help people change the world; if you affect one person’s life, then you are changing the world. His goal is to teach people to provide enough value to others that they are willing to pay for it. Getting traffic to your site is not a business. Writing a blog is not a business. Having an awesome social media presence is not a business. Those things are platforms. In order to actually have a business, you have to be able to solve a problem and make money doing it. Figure out who you will be in business with. Who are you providing value for? Then find out, what are these people trying to accomplish? And the last question is, what are they struggling with? Once you have identified those 3 things, then you can begin to come in and fill those gaps for them. Create content that meets the specific needs that they have, that helps them accomplish their goals, and that provides help for their struggles. Make sure your blog content is exactly what they are looking for; don’t mislead them by posting about topics that are irrelevant to the reader. If they clicked through a recipe Pin on your Pinterest page, they expect to see recipes when they come to your blog. Give the reader something that is very easy for them to do. For example – pulling out a credit card and buying something takes a lot of trust. But if you give them something of value, and all they need to do is give you their email address, they will be more likely to do that than to pay for something. Continue to provide them with more and more value, addressing their specific struggles, and in this process, you can begin to sell them things. You can promote affiliate products; you can create your own products; you can offer services and promotions. Get your readers to sign up for your email list. Nurture a relationship with them while informing them of more ways that you can provide them with value. What If Nobody Is Buying What You Are Selling? What if you are growing your traffic, you are following all of these steps, and yet your bounce rate remains high and nobody is taking the bait? What then? Go to Google analytics and try to understand the behavior of the people who are coming to your site. Are they coming to a specific post? Do they seem to relate to specific information? Or are they just bouncing around from page to page? Is there a disconnect between you and your reader? In Google Analytics, go to Behavior, then into Site Content and further into All Pages. This will give you the top most visited posts on your site. From there, try to figure out exactly what it is that people are coming to your blog for. You can also find out what your most popular Pins are, then click through them to your own site and try to see the experience that people have when they visit your blog. Is there a way to give them more of what they are clicking through for so that they will sign up for your email list? Are you providing content without thinking of ways to monetize? For example, if you have a recipe post, be sure to link to any cookbook that you used, the dishes or cookware, and even the utensils. Don’t miss an opportunity to monetize. If you feel funny about this, or like you are just throwing affiliate links everywhere, remember what we learned in Episode #23…people like for you to give them information and then tell them what to buy! Don’t hold back on affiliate links. And here is a point we have talked about before – is your site mobile friendly? Open your own site with a mobile device and see if your sign up bar shows up. Does your entire sidebar disappear with a mobile device? Do people even see a way to sign up for your email list? 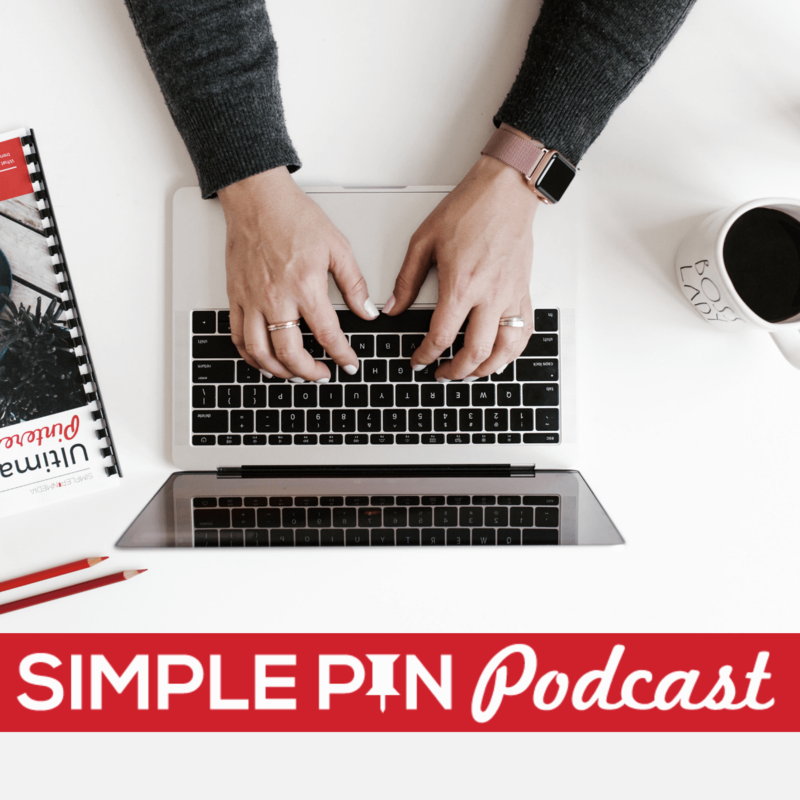 Leslie talked about the changes that Google is rolling out in regard to the pop-ups that bloggers use to get email sign-ups. In the near future, Google will be penalizing bloggers for pop-ups that cover the entire screen on a mobile device. What is a Google penalty? In two words- less traffic. If you are currently using a pop-up such as Opt-In Monster or Lead Pages, make sure that it is turned off for mobile devices. You can leave it on for desktop, because on desktop the reader can still see the content even with the pop-up. Also, be certain that any call-to-action that you have is actually within the content itself if you are optimizing for mobile devices. It is important to not only be optimized for your content, but also for building your email list and your call-to-action. If you don’t know what your users are seeing (on mobile), then you don’t understand them. Think of all the products or services you use that you would recommend to a friend if they asked you about starting a blog. What kind of products would you recommend if someone asked you how they could get started with some basic cooking? The reality is that even if people are curious, they likely won’t take the time to email you and ask the question. But there is a way to answer the question, without waiting for them to ask. Create a resources page and put the time and effort into that page to share all of the amazing products and resources that you use on a regular basis. Give a brief explanation of the item and describe exactly how you use it. Here is Leslie’s resource page on his blog. Because Leslie coaches bloggers, his resource page is filled with the things he recommends for bloggers. Maximizing Pinterest: Be sure to have a Pinnable graphic on this page so that you can Pin it regularly and keep getting traffic to it. To take his resource page to the next level, Leslie actually created content to go along with the items he has on this page. For example, he recommends the Get Response email program. So while he has a link to the Get Response site with his own unique tracking link on his resources page, he also created a load of content to go along with it. Here is a link to his Get Response Resource Center. If you want to try this, create a series of videos showing all of the things you can do or all of the ways you use one of the resources you list on your resources page. Put affiliate links in each video, and watch as your reader gets even more interested in what you are showing them and even more willing to click through and make a purchase. Here is the Simple Pin Resources Page. The only person you should be comparing yourself to is yourself. Are you better off or farther along on your journey than you were a month ago…a year ago? And if not, then how can you get to the next level? When you see others posting income reports that seem completely impossible for you, remember that you can’t see all of the things the person did to get there. Or maybe a certain blogger seems to have their name on everybody’s lips, or their life seems so much easier because they work from home blogging. Just remember that you don’t see the financial struggles they went through before they saw any success. If you’re building a business, you are doing something that is going to cause you to struggle for a significant amount of time. Yes it gets easier, but comparing yourself to people who are farther along on the journey than you are doesn’t get you farther along on the journey. So focus on what you have right now, then decide what you need to do in order to get to where you want to be. We talk about this like it’s easy…”oh get a resource page and watch your income skyrocket”…this is not easy. Just because you aren’t where you want to be doesn’t mean you aren’t doing a good job! It just means you have more to do. When I am focusing on what’s in front of me, I am making more progress than I do when I am looking at everybody else. Walk through the steps Leslie gave us. Go to your Pinterest page and click through your most popular Pins and see what kind of experience your readers have. If you’re looking for a course to walk you through monetization through affiliates, I highly recommend Making Sense of Affiliate Marketing. She went from $0 per month to over $50,000 per month in affiliate sales. And I’ve seen others do the same thing after taking her course. Intro Who is Leslie Samuel? 14:15 What if nobody is buying what you are selling? 23:20 Email pop-ups, or no? I needed to read this. You hit me straight in the face with ‘A blog post is not a business’…. Desperately need to get my ducks in a row! I’m excited to hear about the results!!! I thought that that section was one of the most important set of statements related to blogging I have ever heard. It was a hard thing to hear, but it is so true. I have a question, how google Adsense works with Pinterest traffic? I’ve heard that google doesn’t like social media traffic, so they may disable Adsense account for getting most of the Pinterest traffic. I haven’t seen it affect any of our bloggers. Thank you very much Kate for these blog post. I have seen a Pinterest traffic growth in Google analytics. I loved this episode! I really liked how encouraging your guest was and how he recognized how much hard work it is just creating a blog and his talk about encouragement. We’ve all heard not to play the comparison game before but I guess he’s a coach for a reason because the way he said it really hit home to me. I just started going back through your podcast and this was one I found to listen to on my walk. So much great information! Love the idea of the Resource page and the newsletter info. Thanks so much Mikki! I’m glad you find the information useful! This is very helpful information for beginners like me. Thanks for sharing such a valuable information. Kate, I recently discovered your podcast a few months ago. I have listened to several of your episodes two and three times. I am the reason your plays have increased significantly because sometimes I binge on your podcast. Lol. Really, I love your podcast. I have heard Leslie before, but this time was special. Just like sitting in the congregation and feeling like the preacher is talking to you I felt that way when Leslie started talking about comparison. I am a new blogger, but I am working on my second blog. So I feel like I have a little experience. Some times I find myself comparing my progress to other bloggers which I know is not right. Thanks for having this awesome podcast with excellent guest and sharing great content. My goal is to one day build my blog so that I can afford to be one of your clients.